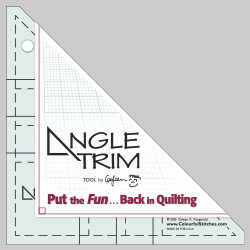 Click here to purchase Angle Trim. Click here for cutting instructions. 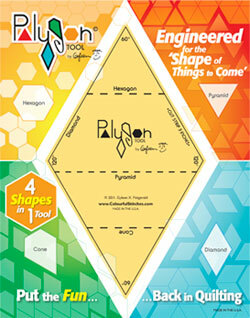 Click here to purchase Polygon3. Make your bigger dreams come true with Polygon2. Great for “Modern Quilts” and is the Polymate to the original Polygon Tool. All 4 shapes (Diamond, Pyramid, Hexagon and Cone) cuts from 5 ½” strip. 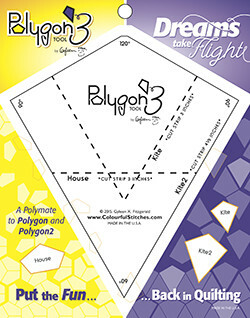 Click here to purchase Polygon2. Join me on Facebook to chatter about the challenges, post your progress, get encouragement and be inspired by the possibility of falling in love…with Polygons. They truly are “The Shape of Things to Come”. Engineered for the shape of things to come. Easy to use and plays well with others be it diamonds, hexagons, pyramids or cones. One tool does it all. And the best part...it is designed to use 3” cut strips for all shapes and is a stash buster’s best friend. Tools by Gyleen will put the fun back in quilting. Click here for cutting instructions. 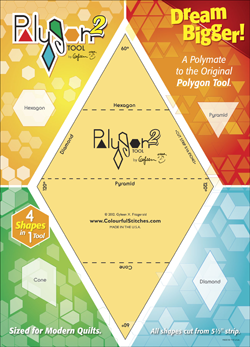 Click here to purchase Polygon Tool. Come turn your scraps, bits and pieces into a stunning Pineapple Quilt that is one of a kind and didn’t require paper piecing. 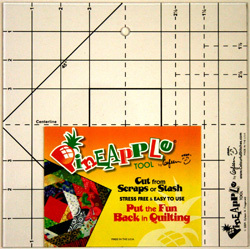 The Pineapple Tool has just enough markings to make a quick and accurate pineapple blocks using 1 ½” strips. You don’t even need to worry about bias, just start cutting what you have jammed into boxes and make a Trash to Treasure Pineapple Quilt. Go totally random and create a mosaic look or divide by light and dark for a traditional look. Click here for instructions. Join the Trash to Treasure Pineapple Challenge and post your results on Facebook. Engineered by a quilter with a quilter in mind!